Catholic education is different. Consider it for your child. The Catholic Church's history in the field of education goes back to early Christian times. There are innumerable examples of how Catholic tradition and wisdom has enriched the field of education over the last 2000 years. From John Bosco who believed that love was more powerful than punishment in the classroom to St. Ignatius, founder of the Jesuit order in 1540, who recognized that the soul is not formed by merely filling students minds with reams of facts. The Catholic philosophy of education does not believe in merely transmitting knowledge and developing skills. It is based on the person of Jesus Christ and on the values of the Gospel, and it works to refocus the human person as the centre of the educational experience. Catholic traditions encourage young people to gradually become more open to the realities of our world, to develop a strong healthy concept of life that includes spiritual, religious, moral, and human values. At the same time, Catholic educators are called to give their students the knowledge they will need for their own well-being and for the common good. 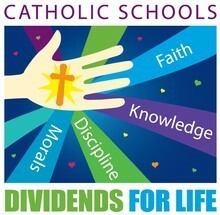 Catholic schools nourish and strengthen students so they can deal with the pressures of society. Students are taught to know the difference between good and evil and to name that difference. Our schools endeavour to educate students in the truth so they are prepared to exercise authentic freedom. By fostering a Catholic world view in students, we are teaching them to transform the world in light of the Gospel. Catholic education is an enduring gift to Canada. Thanks to the courage and sacrifices of consecrated men and women, an impressive network of Catholic schools exists today in many parts of our country. It has greatly contributed to shaping Canadian society through the formation of many leaders in our country. We encourage our students to learn traditional Catholic information in the modern world. Click here to discover the Catholic Saint of the Day.